Home :: Why Use Manual Registers? So, indeed, why use manual credit card or manual debit card registers, or even manual check registers for that matter, especially in the high tech world we live in? Manual registers being currently our main product line, this question is the most challenging one we as a business face. Hence we decided to address that question in a written article, setting up this single page within our website to make our case that even in this era of The Digital Age, The Internet Revolution, The Cashless Economy (almost), even The Paperless Society (getting there), there still remains a significant role for paper-made, manual transaction registers. The article has turned out to be a rather lengthy one, and we apologize for that and ask that you bear with us, as long articles on an online store are uncommon and not so easy to read on any kind of website. To make it less burdensome we have set up links to help you get to and from points in the article that may interest you. But for many, questions like the following three are just as significant, and because our answers to these are relatively short, we will respond to them first, saving the more challenging question, with its more complicated answers, for last. "As long as I have enough money coming in to cover my usual expenses. why would I need any special bookkeeping systems like transaction registers?" "My credit card and debit card providers issue monthly statements by mail or online. Aren't these enough?" "Can keeping manual registers bring to an end those embarrassing situations in which my credit or debit card is declined?" "Hey, wake up Sleepyheads! We're living in The Digital Age! Where do manual registers fit in anymore?" In their attempt to categorize your transactions, online services and desktop applications that download transactions often make glaring errors categorizing them. Payee names are often confusing, the dates are only the dates cleared, and the programs can't add any memos. You can most efficiently fix these problems with the help of manual registers. If you use software that allows, or even requires, you to enter transactions manually, referring to a manual register is the most efficient procedure for inputting your transactions. The use of manual registers enable you to do a "true" bank reconciliation of your online accounts. Your digital data is vulnerable to many notorious mishaps. Using manual registers provide "hard copies" of your transactions from which you could rebuild in the event of a calamity. Living in The Digital Age tends to dull our basic arithmetic skills. Using manual registers exercises these skills and helps keep your mind nimble and limber. Do you need "true" balances and access to your transactions Anywhere, Anytime? 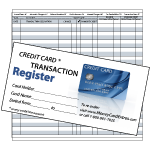 Manual registers always provide the "true" balances of your credit card, debit card and general banking accounts. So do desktop and online apps that allow manual entries to update account balances. But online services based on account aggregation, like Adaptu and Pageonce, under typical circumstances, DO NOT provide "true" balances. You CAN NOT always depend on the apps on your mobile device to give you up-to-date balances and transactions. But you can always depend on your manual registers. Many personal finance applications, desktop as well as mobile and online, do not provide your credit limit amounts and your available credit. These are central features of our manual credit card registers. You have access to a manual register wherever you choose to take it with you. You CAN NOT totally depend on having access to online services like Mint.com wherever you and your mobile device happen to be. You have access to a manual register whenever you need to consult your transactions and balances. You CAN NOT totally depend on having access to online services like Mint.com whenever you need access. "As long as I have enough money coming in to cover my usual expenses, why would I need any special bookkeeping systems like transaction registers?" Sounds like because most of your financial transactions follow a recurring, routine pattern, you feel you don't have any real need to keep track of them in any kind of formal, organized manner. Perhaps the most you do is simply file your invoices, receipts, credit card and bank statements in some folders and stash them in a file drawer in case you ever need to review that information, such as at tax time. On the whole you already know that you bring in a certain amount of income per month and pay out a predictable amount of expenses per month covering a small range of familiar categories, so as long as there are no sharp deviations from your monthly expectations, you feel you've got sufficient understanding and control of your finances (although more income would be nice!) without needing to spend time and energy keeping track of your transactions using some personal finance management system, such as one of the popular software applications you hear people talk about from time to time, like Quicken. Perhaps you recognize that you could derive something of value from using such a system, but feel that whatever empowerment you'd receive from a formal financial management system, it is not worth the "hassle" of keeping it up-to-date. Maybe crunching numbers is just not your thing. You may have even looked into using one of those popular "hassle-free" web-based financial services like Mint.com and Adaptu.com that crunch all the numbers for you automatically, but feel too leery about the risks of revealing to these people your log-in credentials to all your banking and credit card accounts. So, heck with that! We suggest however that at the very least you would benefit by having the simplest of financial tools -- a manual credit card register for each of your credit card accounts, and a manual check register for each of your checking/debit card accounts -- if for no other reason than to provide a single place where all transactions for any particular credit card, debit card or banking account are recorded. Because, at the bare minimum, this will enable you to verify your transactions against the statements provided by your credit/debit card provider and bank to make sure all your entries are reflected in the statements for the correct amounts, and to catch entries on the statements that don't belong there -- suspicious transactions you'd otherwise have no knowledge of. But keeping a manual register can also be of tremendous value when questions arise as to when a certain payment was last paid, how much a certain payment was for, what method of payment was used (credit card, debit card, check, automatic payment), which payments during the year are tax deductible, and so forth. 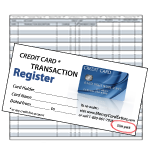 If all your transactions are recorded into manual registers, answers to these kinds of questions are most readily found by flipping through your registers, rather than having to locate and assemble together, then scour over, credit card statements, bank statements, cancelled checks, invoices and receipts, which may often be not very well organized. Manual registers utilized for these basic purposes alone can be maintained in the simplest manner by entering only the essential information: date, payee, a memo, and the amount. In your case there would be no need even to bother with computing the account balances, as that can be frustrating for some (although doing so would be recommended, as maintaining the running balances of your accounts would enable you to reconcile your balance(s) with that of your bank or credit card provider, instead of merely verifying each transaction). Many assume that credit card, and debit card statements already provide all the basic information about your transactions, and, for those who use personal finance software that requires you to type in your transactions, that all you need to do is simply enter your transactions into your computer as you read them from the statements. You already know that for checks that clear your bank in the usual way, only the check number and the date it cleared gets reported on the checking account statement. If you did not record your checks previously into a manual check register or software program, you'd need to rely on cancelled checks or scanned check images for the main details. Credit card and debit card statements do provide more information about each transaction than checking account statements for their cleared checks, but still there is too often insufficient detail. For the most part, they don't provide complete information about the transactions, providing only the date, the vendor's name, city/state and telephone number, a reference number, and, of course, the amount. It is left to your memory to provide the purpose of a transaction, or dig out that receipt somewhere. That is, if you could even recognize the transaction, for many statements don't provide the name of the vendor you recall purchasing from, listing instead some other business whose merchant account processes your vendor's credit card transactions, or perhaps the vendor's official but unpublicized name is listed, but it is one you don't recognize, or it is abbreviated such that it is difficult to identify. To be fair, some credit card companies, like American Express for some of their accounts, do attempt to provide a short, general description about each transaction, and most credit card providers these days provide a year-end listing by category, based on the vendor's business category. All of that is helpful. But nothing measures up to a simple memo in your own words that describes a transaction that can be entered into a manual register while it is fresh in your mind. If you count yourself among the highly disciplined, meticulous few who organize their paid invoices and receipts on a frequent basis, annotating them as to their manner of payment and purpose when it would otherwise be vague or likely to be forgotten, then you indeed don't need a manual register for the purpose of capturing your transactions, for you could wait for your monthly statements and make your computer entries at that time without having lost any essential details, for you could refer to your well-organized, annotated invoices and receipts for clarification if necessary. Even better, you could enter your transactions even sooner, like weekly, and simply reconcile to your monthly statements. But if you are like the rest of us, many of whom don't bother to obtain all receipts, or who toss them, or leave them scattered around the house, or at best stuff them in some envelope, box, or container in the kitchen, then you are rarely crystal clear about many of the charges that appear on your credit card and debit card statements, let alone your checking account statement, even if you do use a computer program (which you update one or two months later). You are more likely not to bother about looking into any questionable charge (unless it is truly outrageous), because you assume it's probably correct, only you've forgotten about it, and it would be too much of a hassle to call about it, or worse, go digging into all those unorganized receipts to clarify a purchase, if indeed you haven't discarded it and could easily find it. That is where your "first responders", hand-maintained credit card, debit card and checking account registers save the day. That's where you enter on a more frequent basis -- preferably daily -- your transactions while they are fresh in your mind, before you stuff the receipts away, so that when you get around to updating your computer program, all you need to do is read from these registers. And what about doing a "bank reconciliation" of your credit card and debit card statements? Personal finance software such as Quicken usually has features that assist with bank reconciliations, so if you used manual registers to get your transactions into the software, you've made it easy on yourself so that you could now take advantage of the application's features, including bank reconciliation. But if you do not use such an application, you will find manual registers very helpful in truly reconciling your credit card and debit card statements. Without them, you only have your memory to rely on -- and maybe a bunch of disorganized, hard-to-handle, hard-to-read, receipts lying around. Because of that, you can't perform a "true" reconciliation, as there is no solid, organized set of records, independent of the card provider's statements, to reconcile with, so at best you resort to merely eye-balling over their statements for any glaring errors and call it a day, unable to expose smaller errors, even fraud, within your accounts. But if you enter your credit card and debit card purchases into a manual register on a regular basis, then this will empower you to perform a true reconciliation to verify the legitimacy of each transaction and confirm the total credit card debt balance or debit card account balance and the credit/funds available for future purchases. Even for a highly organized person like the one mentioned earlier, but who does not use software, being able to perform monthly such true reconciliations easily is a great benefit from using manual registers, as you wouldn't have to hassle with matching a charge on the statement to its receipt; you'd only to need to check it off in your register. Whenever you present your credit card or debit card for payment, you should never feel uneasy about whether or not you have enough credit or funds available to pay for your purchase, or worse, suffer the embarrassment of hearing the cashier or waiter say to you, "Sorry, your card was declined". Maintaining your credit card and/or debit card balances on a regular basis in one of our manual transaction registers assures that you will never be in the dark again about how much credit you have available (when paying by credit card), or how much funds are available (when paying by debit card, gift card, or other prepaid card). Using manually maintained registers as your initial record for transactions is a sure way to improve your organization and to always be in the know as to the available credit or funds before you present your card for payment. This information could even be at your very fingertips once we have available our wallet size registers. (Until then, you could adapt our looseleaf register sheets for this purpose, just cut off the top half, which does not contain the register itself). You'd just need to take a peek at them before approaching the cashier to make sure you are handing him a card that you've already updated before leaving home that shows credit or funds available sufficient for the purchase. If you mainly use credit cards that have generous credit limits, and you typically pay off the entire accumulated balances every month, this concern will likely not affect you except during periods when you've been making a lot of purchases, or a few costly purchases, that may put you close to your credit limits. But for those who not only keep a debt balance, but add to it every month, you need to be sure that you do not get uncomfortably close to your credit limit such that even the next transaction could be the one which is declined. Manual credit card registers updated daily, or even promptly after each transaction, is your best protection against a card being declined, and for many this alone would be the main reason for using them. Our manual credit card registers are especially useful for those juggling multiple credit cards, each flirting with its credit limit. Debit card users living at the edge of their account balance need as well a readily available up-to-date register to keep them informed of exactly how much wiggle room remains. "Hey, wake up Sleepyheads! We're living in the Digital Age! Where do manual registers fit in?" Yes, that is likely the first and most obvious viewpoint many would exclaim, for why use manual registers when we've got computers that do all the things a manual register does -- and much more. Keeping track of your financial transactions involving any kind of manual register seems so "old school", out of step with the Digital Age we all enjoy, given the expanding use of personal finance software applications running on desktop computers and mobile devices, and even right from the Internet. Moreover, the best of these applications are able to access your bank and credit card accounts directly so that transactions can be imported into these apps without you having to input each transaction yourself, thus making keeping track of your personal finances even easier. And with the growing popularity of direct deposits, bill-pay services and online transfers offered by most banks, much of the actual processing and tracking of your personal finances can be turned over to your bank these days. So why would anybody invest the resources to design and introduce to a world that is moving towards "the paperless society" a manual credit card register, when even the classic manual check register is obsolescent, fading into oblivion? The answer to this depends on the extent to which people actually utilize the technologies available in our Digital Age as these relate to personal financial management. So first let us acknowledge the so-called Digital Divide, as there are certainly many people among us who do not have personal computers and other high tech devices and services like high-speed access to the Internet. This article is not the place to discuss the socio-economic aspects of this Digital Divide, only to observe that these same people do pay for many goods and services with checks, debit cards and credit cards. Hence, it almost goes without saying that for those who have little access to Digital Age devices and resources there remains an obvious place for manual registers for those who have no other alternatives for tracking their check, debit card and credit card transactions. Then there is the rest of us who are fortunate to have their lives enhanced through personal ownership or easy access to Digital Age devices and resources for all sorts of purposes, including personal financial management. At the cutting edge of digital technology is the burgeoning trend towards the "cloud", in which computing is moving away from the use of applications installed on desktop computers to those installed on remote servers, accessible from wherever an internet connection is available (whence their great appeal). In the world of personal financial management, a few pioneers, the likes of Yodlee, Mint, Adaptu and Pageonce, spearhead this trend. These companies deploy technologies that access your transactions stored on the websites of your banks, investment brokers, and credit card companies and copy them into an account you've set up on their own website, thus combining all of your financial transactions and account balances onto a single website. This process, a technology called "account aggregation", is further enhanced by them automatically categorizing each transaction and performing various analyses that help you keep your financial matters well managed. Furthermore, these developers have created applications for smartphones and other mobile devices that can access all of this information wherever and whenever you can connect to the Internet, thus freeing you from your home or office desktop computers. With all these Digital Age capabilities you would think that every tech-savvy individual tracking their personal finances would be enrolled in one of these online services. But many people knowledgeable about these services have chosen not to enroll. The main deterrent for most who decline to enroll is that in order for your bank, credit card and other accounts to be accessed by the service, you need to reveal to the service your log-in credentials for each of your accounts. Even with the greatest security measures in place, the same that banks themselves use to secure your information, many people are not comfortable turning over their user IDs, passwords, and answers to security questions to these third-party services and decline joining up, because along with all its great technological achievements, the Digital Age has brought with it an underworld of criminally adept hackers many fear might find their way to their sensitive log-in credentials, some of whom may even be disgruntled or unscrupulous employees of these very same companies. So, already from the start, we have a huge number of folks on the endowed side of the Digital Divide who do not utilize what may be the best that technology currently has to offer. For those who can't embrace these cutting edge online services as yet, or who may have tried them but were not satisfied with their experience, there nonetheless exist many applications, both web-based and desktop, and even some exclusively as mobile apps, that serve their users quite adequately. And fortunately, the capability of automatically consolidating data from all your financial accounts to a single site is not a feature exclusive to those online services in "the cloud": several desktop applications perform this service as well, except that the "site" to which your financial data is downloaded is your own desktop computer. Most notably, Quicken has provided this feature for many years. And several younger applications, such as iBank, perform these downloads quite well. Besides these desktop applications having served them well over the years, many users prefer them over their online, account-aggregating counterparts not so much because they don't trust revealing their log-ins, but because the best of the desktop applications generally provide a broader range of features and functionality than the online services currently offer. For example, you have more control over adding and editing categories, you can track investment accounts more comprehensively, you can customize reports more to your liking, and in addition to, even instead of, using their downloading features you can add and edit transactions manually more extensively than what most of the online services allow. And those desktop applications that offer versions for mobile devices, which usually can sync with the desktop application, provide similar access to your data as the cloud services do, in that you can track and manage your finances wherever you are -- because its all right there on your mobile device. So, for those of you fully immersed in Digital Age technologies, particularly when it comes to personal financial management, such as those who make deposits by uploading photos of their paychecks to their bank from their smartphone or otherwise use direct deposit services, and for most purchases simply whip out their money cards, but when a card is not suitable hardly ever write a check, relying instead on bill-pay services and online transfers from their bank accounts and arranging automatic charges to their bank and money card accounts, and then keep track of all this financial activity with an online service like Mint.com or a desktop application like iBank via their smartphones, then indeed there is less of a need, perhaps even little need, for manual registers. But little need does not mean no need! But first, before we delve more into the role of manual registers in The Digital Age, let us put them into proper context. In other words, where do they fit in the scheme of things? Basically, manual registers simply capture your transactions and provide account balances. In this minimal role of simply recording transactions, etc. many people feel that this is all they need as their personal finance "system", for all they want is to be able to locate past transactions, keep a running balance, reconcile to bank statements and so forth. While we certainly encourage people to adopt a broader system for managing their finances than simply capturing their transactions in a register and updating its balance(s), at best the role of manual registers is not all that much greater than this, for they serve as only a part, yet a significant part, of that broader financial management system. So in no way are we suggesting, as we extoll the benefits of using manual registers, that they can serve as, or replace, a full system for managing your finances. As the best place where your transactions are first captured, manual registers serve as the "first responders" of your financial management system, for once transactions are recorded in manual registers, you can enter them in an organized manner into your financial system, in which you would then assign your transactions to various income and expense categories so that you could measure how much comes in from where (employment, dividends, interest, gifts, etc. ) and how much goes out to which areas of your life (rent, car expenses, utilities, groceries, etc.). Knowing this information further enables you to set up budgets to help you manage your financial responsibilities and to devise strategies to help realize financial goals for your life. To achieve this level of insight into and control over you financial life, there is no question that you need a comprehensive system that is best fulfilled by the Digital Age technologies found in personal finance software, and if you've joined an online service like Mint.com and Pageonce.com, or installed a desktop application like Quicken and iBank, you will be well served by its many powerful and useful features. In their attempt to categorize your transactions, online services and desktop applications that download transactions from your bank and money card providers often make glaring errors categorizing them. Payee names are often confusing, the dates are only the dates cleared, and the programs can't add descriptive memos. You can most efficiently fix these problems with the help of manual registers. Even with the great advantages of being able to access all your accounts on a single website and have its software automatically categorize your transactions, you may still need to edit much of this to suit your purposes and to correct errors made by the software. These programs permit you to enter comments, edit a vendor's name to one you prefer or better recognize, edit the date to the date you made the transaction (rather than settle for the date the transaction cleared or "settled"), change the categories the program automatically assigned to your transactions to more appropriate categories (often the categories assigned are not just improvable, but totally off the mark! ), split transactions among several categories, and add and edit categories and subcategories (Some, for instance Mint, unfortunately do not allow you to add or edit top level categories, only subcategories). Some applications, Mint being one, lessen the problems of unrecognizable payees and mis-categorizing by allowing you to set up rules for recurring transactions. Your rules would define a clearer, more meaningful name for the payee and define the category for that vendor. Admittedly this feature helps lessen the time you need editing all these imported transactions. However, note that for checks that get processed in the usual way, only the check numbers are "known" by your bank and in turn by software that downloads these check transactions, so you need to edit them in order to provide the payees. And since the payees of checks processed in the usual way could not be known by the bank, the online service or desktop app has no clue either as to how to categorize these check payments and hence can only categorize them as "Uncategorized" or simply leave them uncategorized. So in addition to providing the payee, you need to manually categorize these transactions. Helping you manage all this editing and correcting is just the kind of work that manual registers can greatly assist you with, registers in which, for these purposes, you don't even need to calculate the running account balances (which for some may be a frustrating task), but rather just write in the vendor's name, the date, the amount, and a meaningful memo while it's all fresh in your mind, information which you will easily refer to later when you log-in to edit your transactions (rather than fumble around with small, wrinkly receipts, which could get misplaced or scattered about by that time anyway). Once a well designed computer program gets access to your transactions, that is where the important stuff begins. For now your software can now categorize, with your help of course, all those transactions and render enlightening reports that identify the sources of your income and where your income is being expended or invested. Also other operations can be performed on that data, such as budgeting, tax projections and financial analyses of many sorts. We propose that for most people the best way to get your financial transactions -- whether credit card, debit card, checking account transactions, or even cash transactions -- into your computer in the first place is to have already written them in a well designed hand-maintained register, from which you would then enter them, one-by-one, into your software program in an organized manner during your periodic computer sessions. In other words, recording your transactions first into manual registers, preferably soon after the transactions were made while they are fresh in your memory and receipts are still readily available for reference, can serve as an expedient preparatory step prior to entering your transactions into your computer program, whether right away or at a later time designated for that task. Otherwise, time you could spend calmly sitting and typing in your transactions from your manual registers could instead end up being spent full of frustration looking for disorganized and misplaced receipts and invoices (much of which is cumbersome to handle and difficult to read) and squinting at credit card and bank statements. Actually, many of you already enter check transactions into manual registers as a matter of course for your checking account transactions, for when you issue a check manually you most likely follow this up immediately with a hand-written entry into a check register, or onto a checkstub. Why not do the same for your credit card and debit card transactions, using our well designed credit card registers and debit card registers? While desktop applications usually provide features that enable you to "balance" or "reconcile" with your bank and credit card statements, online services like Mint.com do not currently provide any built-in reconciliation feature. There appears to be little incentive to provide such a feature, because essentially these services merely copy over to their site the same transactions and balances as reported on the banks' and credit card providers' sites. So the only form a reconciliation could take is for their users to compare the statements issued by the banks and credit card providers against copies of the transactions imported from those self-same institutions. Because this becomes a matter of simply checking itself against itself, this would not be a "true" reconciliation. So why go through the programming troubles to add some quasi-reconciliation feature. But some feature really should be provided if only to enable their users to more easily discover whether the service itself made errors in performing some of its imports, such as duplicating or omitting some transactions. But even if such a feature were eventually provided, such as simply adding a column of check-boxes next to each transaction, although this in itself would not enable a "true" reconciliation, a "true" reconciliation could take place if manual registers were utilized in the process. How so? Inherent in the notions of "balancing" and "reconciling" is the assumption of having at least two versions of the same records, generated by different means, which you could compare against one another, enabling you to catch and resolve discrepancies. For general banking transactions most folks who don't use a software program usually enter their deposits and checks into the classic check register, and when they get their monthly bank statements they should verify that all the transactions are accurate and then reconcile the ending balance on the bank statement with the balance in their check register as of the bank's date, or better, with the current balance in their check register, which, by the time you get your statement, is usually two or three weeks beyond the bank's statement date. This process generally involves matching the transactions entered in the check register with those that cleared the bank account, looking out for and correcting, or otherwise adjusting for, any discrepancies. After this step, transactions the bank added, such as bank fees and interest, that are not yet reflected in the check register need to be entered into the check register, and then, conversely, adjustments to the bank's balance need to be made to make it conform to the balance in the check register, namely adjustments need to be made for deposits and checks, debit card and automatic charges entered in the check register that simply did not arrive at the bank to be processed or settled by the bank's ending date (we call these "out-standing" or "uncleared" transactions). Also, if reconciling to the latest check register balance, there are likely deposits made and checks issued and debit card and automatic charges made during the two to three weeks after the bank's ending date that need to be accounted for as well (we call these "post-dated" transactions). (Some prefer to include these post-dated transactions under the term "uncleared", but we find it misleading to call transactions that did not even exist as of the bank's ending date "uncleared" as of the bank's ending date.) 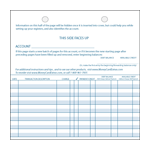 This adjustment is usually performed on a form supplied by the bank, but any sheet of paper will do, by adding to the bank's ending balance any out-standing and post-dated deposits, and subtracting from the bank's balance any out-standing and post-dated checks, debit card and automatic charges. Once these adjustments are made, the bank's adjusted balance and the check register balance should be equal to each other, hence, "balanced". If they are not, the discrepancy is usually traced to errors in calculating the running balances in the check register, most often arithmetic errors, but also errors in writing the amounts to be added or subtracted or writing the resulting balance incorrectly (such as transposing the digits in a number, e.g. writing $490.55 instead of $409.55). So these must now be tracked down and corrected (best done, we suggest, by making an entry for each error correction at your current place in your register but back-dating it to the date the error occurred, or you can just make a single adjusting entry). So, now finally the two independently calculated balances should be equal to each other, "balanced", alas, "reconciled". This demonstrates why true reconciliation is only possible if you have at least two sets of records to compare and contrast. And each set must be generated independently for reconciliation to have any real meaning. For those who do not use personal finance software, our introduction of manual credit card registers now offers the possibility of much more easily reconciling your credit card statements, instead of tediously matching hard-to-handle, hard-to-read receipts against the statements, or, what most folks more likely do -- merely eye-balling over them for possible errors. So by our introducing the credit card register, it is now possible to reconcile both credit card and general banking statements (which include debit card transactions)! By maintaining a manual check/debit card and/or credit card register for each account, you are keeping up a set of transactions and balances independent of the bank's or credit card provider's records. (Software programs that require, or at least are heavily dependent upon, the manual entry of transactions also qualify as an independent set of records for these purposes.) Hence, when it's time to reconcile, any differences reveal real discrepancies or expose uncleared, out-standing transactions that should have cleared long ago. How does this impact online account-aggregation services like Mint and Pageonce? As stated above, for the online services that download your transactions and current balances from your financial institutions' websites, simply comparing a credit card statement or bank statement with the imported transactions and with the ending balance is not a "true" reconciliation, because you are essentially just comparing the financial institution's records with itself. You are not comparing two independently created sets of records. But we wouldn't say that this is a totally pseudo-reconciliation, because you can at least verify that your online service or desktop application made no errors while importing your transactions, i.e., that there were no omissions, no duplications, and that the transaction amounts match. So because this "reconciliation" is "true" in some small degree, we call this "self-check" a "quasi-reconciliation". Even though your downloads were simply a matter of copying what was already provided, the transactions and balances as copied into your online account or desktop program would loosely qualify as a "second" set of records, although not independently generated, which you could and should at least verify against your statements. However, with this quasi-reconciliation alone there is no way to determine if the transactions are legitimate or not. There could be erroneous charges, even fraudulent charges, to your accounts and you may never catch them: just because the imported transactions match the statements issued from the very same financial institutions from whose websites the transactions were imported does not mean they are all bona fide transactions that you yourself made! Sure you might catch a transaction here and there that was entered twice somehow in error, or that a charge listed on the statement never got imported into your personal software. But there could be, say, a $472.58 charge on your credit card statement from some appliances website that you never made, but which, like all your other transactions, was successfully imported into your online account, which the software properly categorized as Household Appliances and included it in the various analyses it performs in your behalf, and you would never discover the error, or worse, theft, using this quasi-reconciliation. Of course, you could catch improper transactions while editing or otherwise manipulating your transactions by dint of your sharp attention to details and your discovering that you have no recollection of a certain transaction. Also you could make as part of the importing procedures your verification of each and every imported transaction while receipts are still handy and your memory still keen. Then when you perform this quasi-reconciliation with your credit card and bank statements you could feel more confident that nothing improper got through "under the radar". In any case, however, you will find that reconciling with your statements while viewing your transactions on your online service's website or mobile app can be very frustrating and uncertain, as these services have yet no way to check off the transactions on the screen while you check them off on your statements (whence the recommendation earlier that they at least provide check-boxes for each transaction.) So you can get easily confused using this method, because only by checking off each transaction on each set of records can you keep the reconciliation process orderly. By entering your transactions into manual registers, you have independent sets of records to compare with, records you yourself entered after making your transactions. These can hence be used as your base set of records to more easily verify on a more frequent basis that the transaction amounts imported into your accounts are accurate and proper, and hence catch anything suspicious right after the import updates, and when your statements arrive from your financial institutions you could reconcile to them again (since they are essentially the same records) using "true" reconciliation procedures that compare transactions you independently recorded, and ending balances you independently calculated, to their statements. (If they provide only online statements, you should print them out so that you could check off their transactions as you check off the entries in your registers, unless your banks and card providers have some way of marking transactions as reconciled online). For all its promises, our Digital Age technology unfortunately is not at the point were we should totally entrust our data only to computers, not simply due to the likelihood of occasional technical failures, or the possibility of natural disasters that could destroy our digital systems, but also due to that wildcard, the human element. The technological challenges of manipulating and securely storing data are daunting enough, but when the human element is factored in -- criminally motivated hacking, accidental damage, sabotage for political or other ideological purposes -- we then get a sense of just how vulnerable our data really is, despite the sound measures developed to secure our data as best as technologically possible. Closer to home, there is always the threat of your computers getting attacked by a debilitating virus, and you may often expose them to conditions that invite accidental destruction (the proverbial coffee spill). But of greater concern is the stability of your own hard drives. For if/when they fail, you can only restore your data if you have reliable back up files to restore from. If you have not backed up your files lately (again that human element), or if the restoration does not succeed for whatever reason and your data can not otherwise be retrieved, then your data is gone. So what we are obviously suggesting is that even as advanced as our Digital Age certainly is, and despite the trend towards "the paperless society", it is not a backwards idea to keep a basic paper trail of your critical financial data, especially where it is simple enough to do so. For users of personal finance software, this means that you should at least have a hard copy of the basic details of your banking and credit card transactions -- the date, the vendor (or if income, its source), the amount, and a descriptive memo of each transaction. From these original "hard copies" you could rebuild your digital files in the event of a calamity. Since manual registers record the raw data of your financial life, they can serve as sets of hard copies. Of course, manual registers, simple paper products, are in no way invincible. They can be consumed in a fire, washed away in a flood, or simply (that human element) lost or stolen. Spending time maintaining manual registers only for the purpose of providing "hard copies" is not what we are suggesting, because if you already using a decent software product, the "hard copy" paper trail we recommend could of course take the form of print-outs from your software application, stored safely. But along with all the other benefits discussed in this article for using manual registers, their serving as an additional set of "hard copies" is yet another benefit worth appreciating. All too often, when presented with minor arithmetic challenges, we all too quickly whip out our calculators or launch software programs to compute the simplest of problems. This is all highly efficient, as it saves us the time and energy that could be devoted to our main tasks. But by the time we reach adulthood, too many of us can no longer perform simple arithmetic problems correctly. Due to our dependence on our high tech gadgets and software, we one day find ourselves struggling to remember the basic stuff, long ago committed in our grade school years to rote memory, the gradual erosion of which impairs our ability to perform even simple addition and subtraction. These are basic skills you should never loose, and their exercise helps keep your brain healthy and your mind nimble. Committing to using manual registers, not only to record your transactions but also to calculate your running balances by performing the simple arithmetic required, will greatly help you both preserve those essential skills and foster mental health. The advantages for using manual registers discussed above apply to all users of personal finance management software. But are you among that large subset who strongly prefer, even require, that the transactions displayed and the balances calculated by your software are truly up-to-the-minute accurate, especially when needing to decide which account to make a purchase from; that you have access to your financial data wherever you are, mainly via your mobile device, such as your smartphone; and that you have access to your financial data whenever you need it, 24/7/365? You may be surprised to discover that manual registers are actually more dependable than their Digital Age counterparts in satisfying these preferences/requirements. When you make a credit card or debit card purchase, the account balance on your card provider's servers (computers) does not update until the transaction is fully processed, "settled". This could take a day or two, sometimes longer. Meanwhile, on your card provider's computers the purchase amount is labeled "pending" and the account balance itself is not yet adjusted to include these pending transactions. When your online service like Adaptu, Pageonce or Mint imports your transactions and balances, it simply downloads this data as provided by the card provider's servers. So regardless of whose website you are visiting, your financial institution's website or the website of your online service, your account balance is never its "true" balance when pending transactions are present. In fact, if you use your money card frequently (and who doesn't), your account balance is almost never its "true" balance, as there are always new pending charges that won't affect the account balance until they are settled. When you use a manual credit card register or debit card register you would enter your charges into the registers and accordingly update to "true" balances, regardless of the settlement period. Admittedly, this is also the case for software applications that support manual entries and include them in calculating your account balances (online aggregator applications do not typically include them in updating balances), but having this feature alone does not render manual registers unnecessary, for as seen throughout this article, there are other reasons why manual registers remain useful, even more dependable in some respects than these software products. And then there is the matter of the monthly payments you make to your credit card providers to pay down or pay off your debt, and deposits you make to your debit account. For those of you who still send off a check in the mail, there is no way the card provider can account for your payment before it arrives. This lag-time is probably a non-issue for those who use their bank's bill-pay services for credit card payments, for the bank most likely pays another financial institution electronically instead of mailing them a check, and the payment gets credited within a day. Likewise regarding your debit account, any online transfers to your debit account will get credited within a day. For a mailed payment or deposit however it is only when they receive it and then credit your account that your payment/deposit will be reflected in your account balance. Until then, neither the official account balance nor the available credit/funds balance will take into account your payment/deposit. When you use a manual credit card register or manual debit card register you would enter your payments/deposits therein and update your balances accordingly after you issue the payment/deposit. The same with your personal finance software if it includes your manual entries when it updates your balances. So, if knowing your actual balance(s), as of NOW, from your standpoint, is important to you, you need a manual credit card register or manual debit card register that you could update regularly, even immediately after making a purchase or making a credit card payment or debit card account deposit, and thus always know the actual, "true" balance(s). Or, we again admit, you need a software application that includes your manual entries in computing its balances (online aggregator applications do not). As mentioned earlier, this software feature alone does not render manual registers unnecessary, for as seen throughout this article, there are other reasons why manual registers remain useful, even more dependable in some respects than these software products. (Be careful: do not assume that your "true" available credit/fund balance is fully available until your payment/deposit is actually credited. Until then, when you make purchases assume that your available credit/funds is the amount before you sent off your payment/deposit, for until your card provider receives and credits your payment/deposit, they can only go by their amount for your available credit or available funds when authorizing a charge). In some cases, the amount pending against your money card is not even the actual charge, a frequent example being when you purchase gasoline at the pump and the gas station requests an authorization from your card provider for an amount from one dollar (to simply verify your account) up to, depending on the going price of gasoline, even seventy-five dollars or more (to make sure you can cover the amount of gas pumped, an unknown value until you're done filling up), who in turn places an "authorization hold" on your credit or debit card account for the amount authorized. Actually, almost all charges start out as "authorizations" until they are "captured" and "settled". For most card users, this process behind the scenes goes on without any notice, but because the entire process does take a few days, when your card is swiped, the first event is for the card provider to verify the card's validity and to authorize the purchase amount. The vendor is not paid yet, nor is your card account formally charged yet. In order to assure both the vendor and the card provider that funds will be there at the end of the processing period (up to a few days typically, but could be weeks), the card provider reserves the purchase amount by blocking it off from your available credit or funds available to prevent it from being used in subsequent purchases, i.e. places a "hold" for the amount until the settlement process is commenced, during which the vendor "captures" the purchase amount by formally submitting request for payment using established procedures, at which time the actual charge is placed against the available credit/funds available, and the "hold" cancelled, and the account balance is formally updated as funds are released to the vendor, which "settles" the purchase. So, until the transaction settles, it is simply pending, which is why your account balance is not changed beforehand, but your available credit/funds is, as the hold is placed against the available credit/funds, not the account balance, for no money has yet changed hands. Since most "authorization holds" are for the exact amount of the charge, there is rarely any notice of this procedure. Some holds however are not equal to what the actual charge is because the vendor, such as our gas station operator, does not know at the time the transaction is initiated what the actual charge will be, so he will seek authorization for at least a token amount to verify the card, or some higher amount sufficient to cover the full cost, in this case a full tank of gasoline. And this is where those "holds" can become quite noticeable. Other businesses famous for obtaining authorizations that don't match the final charge (leading to your card provider placing holds on the amounts authorized) are hotels, car rental companies, and even restaurants (until the gratuity is added in), except that you should assume that their authorization requests (and hence the holds) will always exceed the final bill to protect themselves. It is because almost all charges are initially "authorization holds" that they are considered as pending transactions, and therefore do not update your account balance. Placing an initial hold at the gas pump is understandable, but this practice leads to some annoyance, because you and the gas station both know what the actual charge is when you drive away, but the hold may linger a day or more until the actual amount "settles" and the hold is replaced with the actual charge for the gas you pumped. In some cases, the hold is replaced within a few hours by another hold for the final charge, and from that point onward the amount pending is like any other pending charge. Too often, however, the holds do not get cancelled promptly upon settlement, and "tie up" your available credit or funds available for an unacceptable period of time. This can lead to disastrous consequences if the card is a debit card linked to a checking account with checks and other charges coming in for payment. If the funds available are deemed insufficient due to holds you are not even aware of, especially those that still linger on long after your purchase was settled, then checks start to bounce, fees for insufficient funds or overdraft fees are imposed, and things get ugly quickly. Anyway, this issue can be discussed at great length, but our intent here is to elaborate only enough to better clarify the nature of pending transactions, emphasizing in this section that while pending transactions do not affect the formal account balance, thus rendering them not "true" balances, they do affect however your available credit or funds available, but often in a manner that renders these amounts not "true" as well, due to the presence of authorization holds that differ from the actual charge, some of which continue to hold your credit or debit funds hostage for far too long. And if you happen to need to recall what an actual purchase was during the interim hours or days before it settles, unless they have substituted it with another hold for the actual amount, you will not be able to find it on your downloaded transaction list, because only the "hold" amount is displayed (and some card providers, such as Citi Cards, don't even display pending transactions). So unless you've entered the amount into a manual register or personal finance application other than an account aggregator, you will have to locate the paper receipt (if you haven't already misplaced it!). As emphasized above, for most charges, your available credit or funds available is updated by the card provider almost immediately for all "authorization holds" and the updated credit/funds available is posted on your online accounts. This is quite amazing. The speed at which many computers talk to one another through complex networks behind the scenes in cyberspace when a vendor submits your charge for approval represents one of the marvels of Digital Age technology. Once approved within seconds after the purchase is submitted, having the available credit or funds available update online within a few minutes means that you can log in to your online service, such as Mint.com, and request a fresh update, which will download the updated available credit/funds available, enabling you to determine how much is available for additional spending. But, like we said, this is for most charges. There will be a good number of charges you make that may take even hours before the vendor makes an authorization request, and until then your available credit/funds as reported by the card provider (an in turn your online service) remains unaffected, in other words, too high. When this occurs the stage is set for problems which are avoided when charges are entered into a manual register (or a manually updatable software application) and its balance(s) updated to the "true" amount. But there still remains that little problem with authorization holds that do not equal the actual or final charge that distort the "true" available credit/funds. For even with the available credit and funds available balances freshly updated, it is always the "hold" amount that is reflected, which is not always the actual charge, until settlement day. Because gasoline purchases at the pump represent the most frequently encountered instance of holds that don't equal the actual charge, it is these holds, from one dollar to even a hundred dollars, that most often interfere with your ability to ascertain the "true" amount of your available credit/funds. As mentioned earlier, these holds are sometimes replaced within a couple of hours or so with a hold for the actual charge amount, but during the period in which the unequal hold lingers until the transaction settles, available credit or funds available as reported online is not the "true" amount . This "under-charging" or "over-charging" itself reveals a need for manual registers (or a manually updatable software application). For instance, if you just pumped $52.83 worth of gas but your card provider places a "hold" of only $1, your online available credit/funds balance is going to be $51.83 too high until it is replaced or until the transaction settles. If your account was "undercharged" in this manner, updating your available credit in a manual credit card register or your balance in a manual check/debit card register with the actual transaction amount (or in a manually updatable software application) will assure that you have the "actual" amount of your available funds. When "overcharged" you should write in (or key in) the amount of the "overcharge" so that you calculate your available credit from the card provider's standpoint. Later, when you learn that the actual charge has posted and the "overcharge" cancelled, you would perform those transactions in your register (or software) as well by reversing the "overcharge" (by re-entering it as a credit in your register or deleting it in your software), then entering the actual charge. It might even be wise to enter both the full "overcharge" and the actual charge after you pump your gasoline, as sometimes the authorization hold will not be cancelled promptly when the actual charge settles. Then later when you verify that the "hold" has indeed cancelled out, simply reverse out the "overcharge" (re-entering it as a credit in your register), or delete it from your software app. Unless you already know your gas station's authorization hold policy, you should ask the gas station employees what the authorization hold is, but also use your smartphone or personal computer to access your online account as soon as possible to confirm what amount was actually "held", or contact your card provider by phone. Entering the "overcharge", or both the "overcharge" and the actual charge, to your manual register or software app does skew your available credit/funds balance, and until everything settles and you reverse out or delete the "overcharge", the balance is not in its "true" state. But you need to reflect these "overcharges" in your manual register (or non-aggregator software) to assure that you don't understate your available credit/funds from the card provider's standpoint during the interim. Their number is skewed, but it rules! Not all card providers itemize pending charges on their websites, although they all adjust the amount of available credit/funds. Citi Cards, for instance, does not provide an itemized list of pending charges, nor do they even display a field on their website for reporting the total pending transactions. Some card providers, like First National Bank, while not itemizing pending transactions at least provide an amount for total pending transactions.Not having pending transactions itemized makes it difficult, even impossible at times, to figure out what your "true" available credit or available funds is, because without the details of what charges are pending you can't be sure that one of the scenarios described in the last section is not taking place at the very time you need to consult these balances. Suppose you had a $1 hold placed after pumping $50 worth of gas, then you made a $100 purchase from another vendor whose system is such that they don't request authorizations right away (or temporarily can't do so for whatever reason), so no "hold" is placed against your account. Hence, your available credit/funds on your card providers website will be $149 higher than it "should be". So if a few hours later you needed to know what credit or funds you have available and only had your card provider's website to rely on, and that card provider's website does not itemize its pending charges, then the credit or funds available in this example may still be $149 too high, hours later. If itemizing pending charges was a feature of the website, you could easily resolve the discrepancy because you would see only $1 for the gas, and no entry yet for the $100. (Although this alone could be confusing, because you may assume, wrongly, that by then, the $100 was already accounted for.) But when a card provider's website has no provision for listing pending charges, it is difficult to determine what the "true" available credit/funds is, especially if there were numerous charges during the preceding hours. You'd have to do some frustrating arithmetic: If it's a credit card account for instance, you'd have to first subtract from your credit limit your current balance. This would equal your available credit if no charges are pending. If the available credit reported on the website in fact is different, then pending charges are present. You'd determine the total amount pending by subtracting from what your available credit would be without pending charges the available credit as displayed on the website. But without a listing of pending charges, you may find it difficult to determine what charges make up that difference. Is part of it $1 from the gas station or did the actual gas authorization finally come through (but still pending)? Did that charge a couple of hours ago made online for, say, $37.89, get applied against your available credit yet? You do a little arithmetic, but still come up unsure because there remains a large discrepancy. You resort to digging around for the receipts and order forms you stuffed away, and realize that maybe, just maybe, that charge earlier this morning for $78.99 has not been deducted at all yet from your available credit. One thing you do know, you're confused enough to not being able to rely on the available credit amount currently being reported, as you can't with enough confidence reconstruct what the "true" amount should be. When entries are made to a manual register and its balances updated (or to non-aggregator software), you are relieved of these sorts of confusions and frustrations, because you've entered all the actual transactions not fully reflected on the card provider's (and in turn your online service's) website. Your online, account-aggregator service could end up reporting misleading information when your card provider does not itemize your pending transactions. We observed this in particular with Mint's mobile application. It has a section for listing pending transactions. When there are in fact pending transactions, but the card provider does not itemize them (for Mint to copy and import), then Mint assumes there simply are none, and reports "No Pending Transactions". If there are partial or excessive holds included in the actual pending transactions, these would be revealed if pending charges were listed and it would be understood that the available credit/funds includes these. But since Mint is saying "No Pending Transactions", you may make erroneous decisions about your available credit/funds stemming from this misleading statement. Manual registers used in conjunction with Mint would enable you to catch this bug. For checking accounts, the imported transactions and the balances do not include checks that have been issued but have not yet cleared. Your bank has no way of "knowing" what checks you've issued before they are run through the clearing process. Unlike most money card transactions, which are recognized immediately and take only a few days to "settle", a check can take months to clear if the recipient (payee) does not deposit the check right away. Most banks have a policy not to accept checks older than six months, but there are rarely legal mandates requiring this, and "stale-dated" checks have been known to slip through anyway and clear, even more than a year later, especially if no date was written on the check. Hence it is crucial that you always have a record of all the checks you issue, and be sure to verify that they've each cleared your bank, or were resolved some other way (stop payment, etc.). Also deposits you make that were submitted after the bank's daily cut off time may not yet be included among your online transactions or in your online balance, and certainly deposits that you mail to your bank will not get recognized until they reach your bank. Hence, the balance of your checking account on the bank's website, and in turn on the online service that imports the data, will not be its "true" balance. For if you maintain a check register, the "true" balance in your check register will almost always be different from your bank's balance largely due to these uncleared transactions. This discrepancy is further compounded if debit card transactions linked to the checking account are also still uncleared, "unsettled". This is a well known situation of course, for everybody who issues checks knows about the need to "balance" or "reconcile" their check register's balance to their bank's balance as a familiar, if dreaded, task. A great benefit to using a manual register is that it always gives you the actual balance, provided that you've not omitted any transactions and made no arithmetic errors. When used along with an online service or desktop application, you can "reconcile" to its balance and thus detect any of your errors, and, you never know, even catch a significant bank error now and then, or even an error of the online service, one you likely would never have caught without having two versions of the same data to compare against one another. It would be remiss for us not to mention that most of the online aggregation services do allow you to enter your uncleared checks and deposits manually into their system if you so choose. But from what we've so far observed, only Mint and Hello Wallet include the amounts of these manual entries into at least one of its balances so that a "true" balance can be computed and offered by the service. For Mint, this balance is not displayed as the formal "account balance", for only the bank's balance is reported as the formal balance. Hence, these manual entries are classified as pending transactions and the balance that gets adjusted is an amount called "Available Balance". For Hello Wallet, which reports only one "Current Balance", this balance is adjusted to include the manual transactions (but does not include the bank's pending transactions even though included in their transaction list, so their "Current Balance" could still be way "off" from your manual register's balance). Mint's "Available Balance" or Hello Wallet's "Current Balance" should equal the balance in your check register once the uncleared transactions are manually entered to your online service account (except for the bug mentioned in Hello Wallet). Presumably the program will attempt to resolve these manual transactions later as they clear the bank (likely by making the cleared transaction official after adding your memo, then deleting the pending transaction), but we have seen inconsistencies in Mint, requiring us to manually delete the manual entry to correct duplications. The manual transactions in Hello Wallet can also be deleted, otherwise they expire in four days, so this is likely how Hello Wallet minimizes duplicate entries (the manual entry and the cleared entry later downloaded). Adaptu and Yodlee allow manual entries so that they can be included in budgets and analyses, and the programs do appear to self adjust when cleared transactions are downloaded, but unfortunately they do not include them in any balance, so you can't get your "true" balance with Adaptu or Yodlee. Pageonce does not permit manual transactions at all, so here again you cannot get your "true" balance. Having this manual-entry feature, whether or not you use it to get your "true" balance, does not render a manual register unnecessary, on the contrary, it is from your manual register that you can most easily enter these transactions into these applications, as previously discussed. You first enter your deposits, checks, and debit card transactions into your manual register as the first step in your tracking system, which you can then read from with ease as you enter the uncleared checks and deposits into the online software (leave the debit card transactions for the software to import, which should have already been handled by your service). And if there are complications when the program attempts to resolve the manual entry, your manual check register is there to help you understand and fix the problem. Despite the not so trivial matter with "authorization holds", it is still an amazing experience to log in to your online service on its website and automatically, or with the push of a button, get updates for all your accounts. This is an especially wonderful feature for those who need to know where they stand regarding their available funds for their credit and debit cards while on the go. However, it is a different story with their mobile apps. We were surprised to discover that only one app, Pageonce, allows you to request a true update of your balances from within the app itself. For instance, take Mint: By design, Mint.com updates all of your account balances in three ways: automatically once a day; automatically when you log in (in our observation only after a certain period has lapsed since your last log-in; we couldn't figure out what that certain period is, but there certainly is not an automatic update with every log-in); and when you request an update by manually clicking its Update icon. For their mobile app, when you log-in or otherwise launch/open/awaken the app, if the automatic update has not already taken place for that day during your absence or if it's your first log-in/launch after some hours, the balances will now be updated and downloaded to your phone. However, if you make a credit or debit card purchase before the next automatic update, you won't be able to get Mint to perform another update from within the mobile app itself. You can tap the refresh button, and the screen will say "Refreshing" for a few moments. And it also says after the refreshing that the accounts are "Updated" as of the current date and time. But this is not at all true, for what occurred was a reload from their computers (servers) of the account balances as they currently exist. Since the accounts are not in fact updated, saying so is misleading. In other words, tapping the so-called Update icon in the mobile app does not invoke the same function as clicking or tapping the Update button from within the actual website entered from a browser (which does always perform a true update, or perhaps we should say attempts to do so, for we have seen these attempts often fail to achieve a true update). Unfortunately, this is the case even if you formally log-out from the mobile app, then log right back in, hoping to trigger, a true update. But again, this also only results in a refresh/reload, probably because even on the actual website if not enough time has elapsed since your last log in to "justify" a fresh update, it won't be performed just by logging in. There is a work-around, fortunately, but it is a bit awkward and time-consuming: you can log out of the mobile app, then go to and log in to the main website from your browser, which may trigger an actual update, but if it doesn't you can tap the Update icon within the website. Once the accounts finish updating, you can log out from the website, then log back into the mobile app, which will now, alas, download the latest updates. This workaround is awkward and time-consuming given that, even though your browser may automatically zoom in to expedite moving around the otherwise tiny screen, including the log in screen, you still have to swipe around the website clumsily until you log out. Then there's the extra log ins you need to type. Having to do all this challenges one of the purposes for having the mobile app in the first place, that of easily/quickly obtaining updated, "true" account balances at your fingertips. On top of this deficiency, we also noticed a glitch in Mint's mobile app, for the available credit balance won't refresh right away to the new value after the "real" download. It eventually does refresh after some minutes (or sooner), so maybe this is a simply a delay while the software handles other priorities in its event queue, i.e., "to do" list. But we would not have even realized this glitch had we not had the updated available credit already calculated in our manual credit card register and seen the discrepancy. If we made any purchase based on the displayed amount, it would have been a purchase based on a truly inaccurate balance and our purchase would have been declined if its amount exceeded the true available credit. Other mobile apps that do not permit the user to request a true update from within the mobile app include Adaptu Wallet, Yodlee, and Hello Wallet. No doubt there are more, but we have only tested so far a few of the more popular finance mobile apps. As stated, Pageonce so far in our tests, is the only mobile application that supports update requests from within itself. It would be surprising if it did not, for Pageonce is primarily designed as a mobile application. Adaptu Wallet, is no doubt a wonderful mobile solution for many, but it only reports your available credit as part of a bar graph. The complete bar represents your credit limit, the amount of which is not stated textually anywhere. The bar is filled up to the extent of the credit in use, i.e. your debt balance (it does state the debt balance in text as well), but the available credit is only represented by the portion of the bar that remains empty, and there is no text provided translating that empty space into a readable amount. So all this tells you at best is that you have a lot or a little available credit left to your credit limit, whatever that is. Adaptu's developers apparently decided that folks aren't all that interested in knowing their exact available credit. But for someone who really needs to know the actual amount, this visual representation is certainly not adequate, especially if you are moving in close to your credit limit. With a manual credit card register you can compute the column that tracks available credit and know exactly how much you have available, literally, not merely colorfully via a pretty but unannotated graph (but we do have to give kudos again to Pageonce, which does display a similar graph, but also clearly states the amounts of your debt balance, available credit and credit limit). Most of the mobile apps are relatively young, as the smartphone revolution is still in its early years. But notably, the grandparent of personal financial management applications, Quicken, no longer has a mobile app, likely because its owner, Intuit, bought out Mint.com in 2009, closing down its own online service, Quicken Online, and its mobile counterpart. So Quicken users on-the-go who need access to up-to-the-minute account balances must lug around laptop computers on which Quicken is installed, or sign up for Mint.com, or other online service, and install their mobile app on their mobile device, maintaining both systems in parallel. But we have already seen some of the deficiencies of these online services, including Mint, so even Quicken users who use these services could be greatly assisted by using manual registers as well, even within the desktop application (as discussed earlier for entering transactions, editing imports, etc.). [UPDATE: around October 2012 Quicken released Quicken 2013, which offers a mobile app as one of its features]. Speaking of Quicken, no doubt the most popular desktop personal finance application, its developers have gotten it right in this regard, for if you provide Quicken your credit limit, the program will compute and display your available credit alongside the debt balance at the bottom of the account's register. But we wonder whether Quicken has some proprietary claim for this easily programmable feature, for it is surprisingly absent from many other applications. For example, we looked at the latest version of the desktop application, iBank. We were surprised to discover that with iBank, neither its desktop app nor its mobile app has any provision for obtaining and reporting your credit limit or available credit on your credit card and credit line accounts. Like many other apps, iBank only tracks the debt balance. Some of those other apps which we so far have tested include SplashMoney, HelloWallet, Wave Accounting, and MoneyStrands. We have seen screen shots of a lot more, and none seem to support anything more that the debt balance of credit cards. Again, like with Adaptu, developers have somehow reached the conclusion that no one cares enough for these numbers to want their otherwise full featured software to track them. So for those who need the balance of their available credit or the amount of their credit limit, iBank and the others listed come up lacking an important feature. This omission also points out that, even in the Digital Age, important features of a software application can simply be overlooked or deliberately left out at the discretion of the developers as they weigh development goals, completion time frames, and marketing considerations. Anyway, these applications may not support your needs to keep track of your available credit and to always be clear about your credit limit, but our manual credit card registers DO: our credit card registers provide on each page a line to enter your credit limit and a dedicated column for tracking your available credit alongside the column for tracking your debt balance. We feel that our Available Credit column is essential, for it always lets you know exactly how much you have left to spend (assuming you calculate its balance accurately), just like a check/debit card register's balance lets you know exactly how much cash is available in your checking/debit card account to spend. Besides having to be concerned about the accuracy of your account balances when using the digital age technologies delivered by the Mint.coms of the world, those who need from these services their account information wherever they are, need to consider that these services are only available where there exists an Internet connection. If you are using a laptop, you need to plug in to an ethernet network or wirelessly connect to a Wi-Fi network. These are widespread, but not available everywhere. Fortunately for those with smartphones this may be a minor issue, for even if you can't access a Wi-Fi connection at your location, your phone will resort to using its own 3G or 4G connection capability to access the Internet. So wherever you can get a phone signal you can likely get connected to the Internet, even in remote rural areas serviced by a cell phone company. However, laptop or smartphone, in the event that, for whatever reason, your connection is lost (cell towers damaged from severe weather, a rare solar flare storm disrupts communications, or you roam into an area that is a "dead" spot or a region where there is no service) and you need to review your accounts or consult them to see which account has enough funds or available credit for a purchase, you will be up a creek without a paddle if there is no connection available. You'd have to wing it and hold your breath when you present a card that you hope has enough credit or funds available on it, or just cough up the cash, cash you were planning to use for other purposes. Manual registers transcend this problem, as they can follow you anywhere and don't depend on Internet connectivity in order to provide you with the information you need. Even with a solid, fast Internet connection available, your computer or smartphone is not going to be able to access your financial data if the website of the online service is down for maintenance, upgrade of its software, or other routine reasons. Admittedly, this should not usually be any big deal, for the managers of the site would normally choose a time that would create the least inconvenience for their users. You would think so anyway: There have been several times when we attempted to access Mint around 10PM only to get directed to a web page reporting that the website was down for maintenance. For many perhaps 10PM is late enough, but we felt that this was too early to close down such a high-demand website. Anyway, it is more likely that your online service is up and running well, but it can't sometimes connect to one or more of your financial institutions for similar reasons, but on the part of those institutions, or just other connectivity issues, usually temporary. The following is an error message we get frequently from our Pageonce account: "We are currently experiencing technical difficulties with this account. We are aware of this issue and are working to fix it. If you continue to receive this error, please submit a support request." And similar messages were received regularly from Mint, Adaptu and others, and the connection issues have all so far been resolved within a tolerable time frame. Our purpose here is not to berate these online services, but to point out that you may not always be able to get the information you need whenever you need it. And the connectivity problem may even exist on your end, as when you've overlooked recharging the battery of your mobile device and it goes dead! Assuming that isn't the case, the obvious alternative of course is that if it's your online service that is temporarily down, you most likely will be able to get to your information by going directly to the website(s) of your financial institution(s), which likely won't be down at the same time, or won't have any problem otherwise with your attempt to access the website directly, assuming, that is, that you haven't forgotten or lost your log-in credentials for the institution's website(s) you need to access. Again, manual registers transcend this issue altogether since they do not rely on Internet connectivity, and hence are ready anytime you need to consult them. Speaking of accessing your data whenever you need to, the business dealings of your online service provider could jeopardize access to your data -- whenever! A closure, merger or sale of their business could result in serious delays in getting access to your financial information, as you would have to download your data to your desktop computer, converting it into a CSV (Comma Separated Values) file so it can be read by other programs that support this format, then acquire or enroll into another software application that can import CSV files. You may have a short window for doing this after the announcement of the closure/sale/merger. Failure to perform this conversion during that time frame could mean loss of all your historical data. This situation is not new in the world of online personal finance applications. Wasabe and Thrive closed down in recent years. The most well known event was when Intuit, the owner of Quicken and Quicken Online, shut down Quicken Online in 2009, several months after purchasing Mint.com, its competitor. Despite promises of a smooth migration of the Quicken Online accounts over to Mint, it was later realized that there were too many technological issues involved to support the migration, and the only way Quicken Online users could salvage their data was to download it into CSV files. Those who didn't lost access to all their historical data. Many who would have, couldn't do so in time, for one day Quicken Online users got surprised by an email stating a closure date within weeks, and many could not adapt in time. To lessen the impact of such an occurrence in the future, you could enter your transactions into manual registers in parallel with your use of your online service, so that you'd have this paper trail of your data in the event you need to access your transaction history during any period when shopping around for and migrating over to new software, or as a backup should you need to reconstruct any history lost due to business decisions of your online service provider over which you have no control. What these points reveal is that even for persons who enjoy the cream of the crop of digital age technologies -- state-of-the-art computers at home and at work, accompanied by smartphones at their fingertips -- if having access to accurate credit card, debit card and banking account information, wherever you are, whenever you need it, is a priority for you, then manual registers may be more than a convenient accessory, but an actual necessity. For as we tried to demonstrate above, the Digital Age will have to see a lot more development before manual registers become truly obsolete. Mind you, we are not at all recommending that you trade in your software for a manual system beyond manual registers. To do so would truly be taking a step backwards technologically speaking, although there still exist some fine manual systems for personal and small business financial accounting. Manual registers are only part of a broader financial management system centered on a dependable accounting system, whether software based or manual based. If you've joined an online service like Mint and Adaptu, or installed a desktop app like Quicken and iBank, you will be well served by its many powerful and useful features, despite the shortcomings noted above. But your needs for up-to-the-minute accuracy, access on demand, and the full range of financial information will not be found there. Your needs will be best met by utilizing, we dare say, two methods for capturing your transactions, your software's downloading of your transactions from your financial institutions as usual (and/or entering your transactions manually), and your maintaining a set of manual registers (one for each account) in which you write in by hand each transaction and update the balances manually using grade school arithmetic or a calculator. "But this is redundant", you may protest, "One of the main reasons importing my transactions is so appealing is because I don't have to spend time duplicating what's already been accounted for once already!". We do sympathize with this feeling, and if your software was not limited in the ways we discussed, there would be no need for this recommendation. But redundancy is no stranger in the digital world. Particularly when it comes to your critical data, redundancy has always played a vital role, such as even the constant plea to have a backup of your data, itself a form of redundancy. Large enterprises, including your online service, spend millions deploying computer systems based on RAID technology (Redundant Array of Independent Disks), which incorporates redundancies, in ways we don't know how to explain, to speed up disk access and, in some of its configurations, to protect data against disk failure. Your need to supplement your personal finance software with manual registers to make up for its shortcomings is just another instance where you need to engage redundancy. And speaking of backups, manual registers used in addition to your high tech financial software provide a type of backup of your data, its raw elements anyway. We focused a lot above on smartphones because they are at the pinnacle of personal computing due to their ability to access the Internet wherever there is a cell signal and to run thousands of useful applications that have been developed and will continue to be developed over the course of The Digital Age, many of which connect and integrate with Internet sites themselves. And one day such services as Google Wallet and Square's Card Case, which enable you to pay for goods and services through you smartphone, without the need of a physical money card, will eliminate the need for credit and debit cards altogether! But, as we have shown, even the high tech smartphone phenomenon has not done away with the need for manual registers when it comes to personal financial management. Of course, not all users of personal finance software need their financial data available at their fingertips through a smartphone, or demand that their accounts report their "true" balances as discussed herein, as there are many features available in these software applications that as a whole dwarf some of their shortcomings in comparison. Still, even for those who use online or desktop financial software mainly for their broader features and who access them not only with smartphones but with ordinary computers, we have presented concerns that justify, even call for, the use of manual transaction registers to assist you with those applications. To sum up this section, while pondering this challenge about the use of manual registers in the Digital Age, we did wonder what software features would indeed render such registers all but obsolete for the tech savvy among us. Actually if only a few more, simple features were implemented this could be achieved. Desktop applications, standalone mobile apps, and web applications not built around account aggregation would more easily achieve this than online aggregation services since they are designed with manual entries in mind, which is the only way "true" balances can be calculated (which is why we had to acknowledge them in several of our earlier points). With the mobile versions of their applications, applications like iBank could really knock manual registers into obsolescence for high tech users if they were designed to fully serve their users on-the-go. For if the mobile app provided both the true account balance and the true available credit/funds for its money card accounts (and the credit limit for its credit card accounts) then all you would need to do is keep these apps updated manually and you would have all your information truly at your fingertips - digitally alas! Such a design would display both the account balance and available credit/funds balance for each money card and credit line account on a single scrollable page along with all your other account balances so you could easily see all your balances without having to tap into other pages to get the available credit/funds amount. There would also be some indicator to flag whether any pre-arranged transaction(s) is coming up so that you won't make a charge or expenditure that would result in your available credit or bank balance being insufficient to meet the upcoming pre-arranged transaction(s). We've looked at many mobile apps, but only one, Pageonce, displayed on its listing of accounts both the credit card's debt balance and its available credit on a single scrollable page. (More kudos to Pageonce. However, like other online aggregator services, Pageonce falls short in not being designed to report "true" account balances when unsettled transactions are pending or when checks and deposits have not cleared). And only Mint and Adaptu Wallet join Pageonce in providing the available credit at all (with Mint and Adaptu Wallet though you have to tap into each account to get your available credit, and, as stated earlier, with Adaptu Wallet the available credit and credit limit are only graphically represented). We shopped Apple's App Store and could find no other iPhone app that provided both the credit card's account balance, i.e., its debt balance, and its available credit in their account listing. They only provided the debt balance. Likely that is all they track within their entire applications. Again those developers! It seems to us that when you're mobile, on-the-go, you'd be more interested in the amount of funds you have available to spend, not as much in how much you owe at the moment. Well, okay, you'd sometimes want both with equal importance, particularly if you usually pay off your credit card debt every month and having this amount easily available on your smartphone would help you keep track of where you're at with that. So, maybe one of the features in the "killer" mobile app that would kill off the need for manual registers, would be the provision of two screens for account listing, which the user can toggle between, one which displays only the credit/funds available and the other screen which displays only the formal (but "true") account balances. So until features such as these are available on mobile apps, manual registers retain an important place in the Digital Age. The manual registers available from MoneyCardExtras.com are designed so that, like Mint.com and other online services, all your accounts are gathered to a single place, usually a single checkbook cover containing multiple manual registers. You have all of your essential account information at your fingertips for each account, your banking/debit card balances, the debt balances and available credit balances for all of your credit cards and credit lines, and a listing of your recent transactions. So, to sum all this up, putting to use a manually maintained credit card and/or debit card register for each of your cards goes a long way towards enabling you to get and keep a grip on your personal finances. These can be used in a minimal way (entering transactions without updating the balances)by persons who otherwise feel no need to utilize any formal accounting methods, for at least they can now store their transactions should the need to review them arise, and they would also be able to verify the transactions against their statements. This minimal usage can also be used for those who use personal finance software,including subscribers of online programs that aggregate all of your accounts, for in this circumstance you will find that by jotting down the essential information in a manual register that this information will assist you in editing and verifying the transactions downloaded into the program. For those who prefer or require up-to-the-minute accuracy of the balances of their accounts, manual registers easily and handily satisfy that preference or requirement. Software that fully supports manual entries and includes them in the computation of their balances, and provides a mobile application where account information can be readily accessed, added to, and edited on-the-go can also satisfy this preference/requirement, its just that none that we know of sufficiently do so because either available credit is not supported (such as iBank), or where available credit is supported there is no mobile application provided (such as Quicken). For those of you who live close to the edge of your credit or fund limits, a very welcomed side benefit, if not the main benefit, of using manual registers is that you no longer need to hold your breath when you submit your money card to pay for groceries, restaurant bills, gasoline, and any other situation. For you would keep the available credit or balance columns of your registers on each of your cards up to date as a routine practice.